BANGI, 7 Dec, 2012 – Researchers at The National University of Malaysia (UKM) are trying to predict outcomes of seemingly random events such as the weather and encryption by using a mathematical theory that studies the behaviour of dynamic systems known as the Chaos Theory. 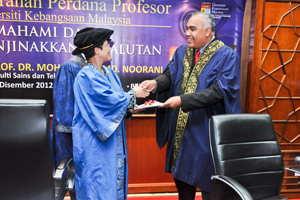 Professor Dr Mohd Salmi Md Noorani of UKM’s Faculty of Science and Technology (FST) said the aim is to provide models for which scientists can use to try to predict outcomes of something that looks unpredictable as the weather and to help in encoding sensitive documents. Delivering his Inaugural Lecture today, Prof Mohd Salmi said the term Chaos Theory or Deterministic Theory, implies disorder or lack of rules or randomness. As we commonly think of chaos, we might think of the behaviour of people rioting. But this would not be true. He said some systems, like weather might appear random at first look, but Chaos Theory says that these kinds of systems or patterns may not be so. If people pay close enough attention to what is really going on, they might notice the chaotic patterns. The main idea of Chaos Theory is that a minor difference at the start of a process can make a major change in it as time progresses. Quantum chaos theory is a new idea in the study of chaos theory. Quantum chaos as a field of study grew out of quantum mechanics. At the time that many of the theories driving quantum mechanics were formulated were that certain systems exhibited chaos (randomness) in their classical limits. As an example, take a pendulum that is attached at some point and swings freely. Connecting a second pendulum to the first will make the system completely different. It is very hard to start in the exact same position again – a change in starting position so small that it cannot even be seen can quickly cause the pendulum swing to become different from what it was before. Essentially, the theory looks at something called sensitive dependence on initial conditions. This means that even a very minute change in the initial conditions of a system can have dramatic effects on that system over time. Weather is a system that is studied widely so as to be better able to predict what conditions will be like. The other use of Chaos Theory in Prof Mohd Salmi’s research is in generating keys to encrypt texts. The problem with these mathematical encryption systems is that the process is mathematically derived, and the algorithms published. Since the Chaos Theory is about making some simple set of rules that become complex but has the same outcome, he said his team wants to formulate a model which can lock information but also unlocked using the same model. Prof Mohd Salmi said he and six post-graduate students are working on methods based on the research of Edward Lorenz, an early pioneer of the theory. He was working on weather predictions in 1961 and was using a computer to help with the calculations. At that time, the advent of the computer with its ability to do virtually simultaneous large scale calculations was invaluable to the promotion of the theory. Lorenz had initiated a sequence of data based on twelve variables in his attempt to predict weather. He wanted to see the sequence again, so re-entered the data. To save time, he began the new simulation in the middle of the old, using a printout from the prior calculations. The weather patterns the computer predicted from the new simulation was very different from what had been initially predicted. Working backward, Lorenz discovered that he had entered the data only out to the third decimal point, whereas in the initial simulation, he had used the same data out to the fifth decimal point. These differences are really very, very small and according to the thinking in those days, should have had only a tiny impact, if any, on the resultant predictions. A simple example is to predict the outcome of a football game. No matter how many variable factors are taken into account e.g the number of goals scored in previous games and the goal average of the teams in earlier matches, there is no sure way to determine the outcome beyond guesswork. He added that other areas utilizing chaos theory principles to extend and better understand the systems they deal with include psychology, sociology, biology, economics and so on. This most interesting concept has even been applied to the movement of traffic on roads. 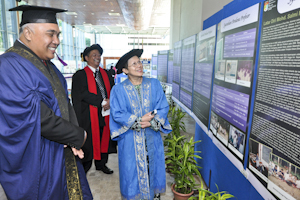 Prof Mohd Salmi gained his Bachelors of Science (Mathematics), his Masters degree and PhD at the same institution – the University of Warwick, Britain. 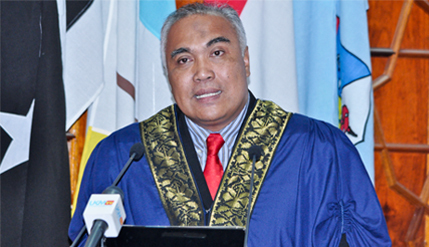 He started his career at UKM as a tutor in 1985 and appointed a lecturer in 1986. In 1996 in he was made Assciate Professor and Professor in 2006. He had also been Head of the Mathematics Department and is now a Deputy Dean ( Students and International Relations ) at the FST.